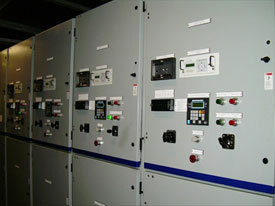 IPS switchgear and controls at the heart of Atlantis Paradise Island’s emergency power system. This Featured Application was written and produced in 2008 for our client, Industrial Power Systems, Inc., (IPS) of Jacksonville Florida. The article is posted on their website and the PDF brochure, also created by Concept Communiqués, is still used today as a presentation handout, a customer mailer, and a brochure at industry trade shows. At the heart of making sure this astonishing and complex destination resort operates without interruption to its electric power, are distribution and emergency control systems custom-designed by Industrial Power Systems of Jacksonville, Florida. Just north of the Bahamian island of New Providence and across the harbor from Nassau lies Paradise Island and Kerzner International’s famous ocean-themed casino-resort, Atlantis Paradise Island. Once owned by Donald Trump, and later Merv Griffin, Paradise Island and a languishing Resorts International was purchased from Griffin in 1994 by South African entrepreneur, Sol Kerzner. Kerzner International Holdings immediately launched an ambitious, ongoing renovation and development of the existing resort infrastructure into what is now Atlantis Paradise Island. Within eight months the former 1,147-room resort was completely renovated and new restaurants and recreation amenities added. The centerpiece was a remarkable 14-acre waterscape with a 3.2 million-gallon saltwater habitat of six exhibit lagoons, 40 waterfalls, and two underground grottos for marine life observation. The first phase of Kerzner’s plan transformed almost the entire island into a tropical paradise, with a healthy bottom line. In the second phase from 1994 to 1998, Kerzner invested more than $800 million creating the mythical city of Atlantis and the resort’s signature pink Royal Towers hotel and casino. The 1,200-room hotel/casino/marine habitat complex alone cost $650 million. The Royal Towers’ 50,000 square foot casino is the largest in the Caribbean. Phase III, just completed, is a major $1 billion expansion adding a new 600-room all-suite hotel tower (The Reef Atlantis), a major conference center, a $200 million five-star caliber condominium hotel tower (The Cove at Atlantis), and Aquaventure which stretches over 141 acres of rivers, rapids, water escalators, waves, water slides and a man-made lagoon for dolphin encounters called Dolphin Cay. Today, Atlantis Paradise Island features more than 3,000 guest rooms and suites, 22 restaurants, 20 bars and lounges, and over 60 acres of pools, waterfalls, and marine habitats. Exotic destination resorts require extraordinary reliability in their power distribution and emergency control systems, ensuring that guests are always comfortable and safe; especially when loss of utility power occurs. The same level of reliability must also be built into the operations-side of the enterprise where essential services such as the resort’s data centers are protected from loss, and emergency management systems are available on demand. At another level, Caribbean destination resorts are vulnerable to tropical storms, and having the capability to isolate complexes from exposed utility power lines to generate and control power from on-site resources before, during, and after storms presents a reinforcing level of security and comfort to owners and guests alike. All primary power to Atlantis Paradise Island is provided by the Bahamas Electricity Corporation (BEC), the national electric utility. To ensure power is always available to the new Phase III facilities during unpredictable off-island events including storms and unscheduled utility outages, the engine/generator distributor, Boca Power Systems, Inc. once again chose emergency generator control switchgear custom-designed and built by Industrial Power Systems, Inc. to back up the BEC power supply. To distribute primary power from the utility and provide control coordination with the emergency system, IPS also designed and built the main distribution switchboard that provides power to each of the six separate Phase III substations. 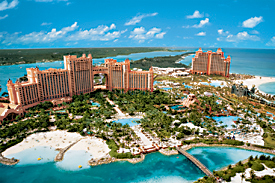 Selecting IPS to custom-design these systems had important precedent at the Atlantis Paradise Island resort. Phase I did not include an emergency power system but in 1998 Industrial Power Systems designed, built, and completed the installation of the main switchboard and generator control switchgear for Phase II and the resort’s famous hotel and casino—The Royal Towers. Industrial Power Systems, Inc. has built a solid reputation over 25 years for reliability in the design and construction of distribution and emergency control systems installed in the hospitality industry. Following on the successes of Phase II and working with Boca Power Systems, IPS proceeded to design the main power and generator control systems needed for Phase III. The IPS-supplied main power distribution switchboard is rated 7.2kV, 3 phase, 60 cycle, 1200 amp maximum. It is designed with two utility feed breakers and two generator tie circuit breakers tied to, and providing controls and metering for, separate distribution busses, ‘A’ and ‘B’. The two busses are linked by a main bus tie breaker in the generator switchgear for emergency operations. Power is distributed through fused load isolation switches on both main busses to the resort’s substation loads. As installed, seven 2,000 kW Mitsubishi engine driven generator sets provide 14 mW of emergency electric power but, as-built and supplied, the IPS paralleling switchgear is designed to accommodate the addition of one future 2,000 kW generator set. Each set is rated 2,000 kW, 7200 volt, 3-phase, 3-wire, 60 cycle, and was built by Collicutt Energy Services (B.C.) Ltd in Canada. The generator set system is operated and controlled by the IPS medium voltage generator paralleling and control switchgear. The switchgear is constructed with two main busses, ‘A’ and ‘B’, both rated 7.2kV, 1200 amps. Three generators are dedicated to bus ‘A’, the balance to bus ‘B’. A bus tie breaker in the switchgear provides full interconnection between the two utility/generator busses when a power failure occurs on either bus. In the event of a total power failure the bus tie breaker remains open and available generators dedicated to each bus provide the backup power necessary for that bus. Critical loads — data centers, fire pumps, emergency lighting and systems, etc. — are served through one of the resort substations with bus ‘A’ dedicated to provide emergency power to this substation. In the event of a loss of power at this bus, even with normal utility power being available, the switchgear will initiate an Essential Bus mode of operation where generators 1-3 will start automatically and run for as long as required. Should it be necessary to prepare for a storm, the system is designed to be isolated from utility power and non-critical loads when called upon, while providing full power to all loads, from all available generators, for as long as the emergency power is required. System control and automation is through MicroPro (Wexler) engine controllers, a master Allen-Bradley Rockwell programmable logic controller (PLC) which constantly monitors utility power supply and quality, and the touch screen operator interface panel (OIP). The OIP, or Human/Machine Interface (HMI), is the operations center for the entire system and allows operators to monitor system status and data, set system operating parameters, including generator sequencing, and automatic load demand and load shed set points, and to test the engine/generator sets and transfer controls with or without load. IPS on staff programmers designed, wrote, and installed the detailed programming software for both the PLC control logic and OIP monitoring. 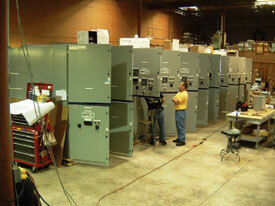 Advanced Manufacturing & Power Systems, Inc. (AMPS) of DeLand, Florida, packaged the generator sets, generator paralleling and control switchgear, and main power distribution switchboard into custom-built, outdoor, weatherproof and acoustically controlled enclosures prior to delivery to site. Atlantis Paradise Island’s Phase III expansion is now complete, and IPS’s equipment is at the heart of it all, working behind the scenes to ensure around-the-clock power reliability for the many thousands of guests and employees of this spectacular Caribbean resort. IPS looks forward to the opportunity and the challenge of implementing whatever the next phase of Sol Kerzner’s ongoing vision may be.